Learning how to work with concrete is one of the most important trade skills to know. Whether you are a contractor or just a home owner learning how to work with concrete is going to pay dividends time and again for you. Learning solid concrete fundamentals will allow you to take on projects for pennies on the dollar that you would normally need to hire a mason or concrete contractor to do. Furthermore if you take the time to learn a little about the construction medium you are working with beforehand this will allow you to do jobs only once...as opposed to doing all that work only to have it fail early again! Fortunately concrete working is not black magic and for the most part it will be a simple and straight forward process for you...but be warned that the subject of concrete is anything but simple, and truly concrete is one of the deepest technical subjects that you can dive into, should you desire. But for the most part, the average home owner with a pothole in their concrete driveway does not need to know about rare chemical reactions in certain structural concrete applications. By the time that you get to the bottom of this page you might not be able to determine an engineered mix design for a site specific application...but you will know how to make strong concrete, how to form and place it, how to modify certain properties like how strong it is, how heavy it is, how fast or slow that it sets up, as well as most of the finishing tricks and techniques you will need. 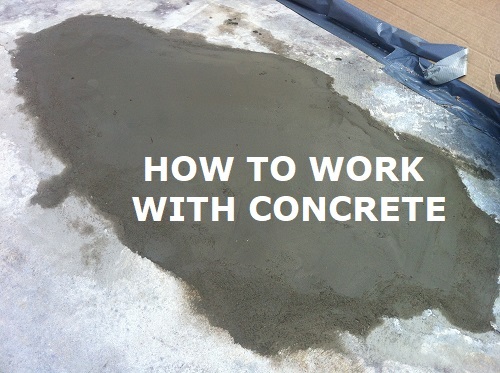 Please note that no matter how much you study up on concrete, and how easy concrete workers make finishing large flat expanses of concrete look, doing this is actually very hard. Flat work finishing takes practice, muscle memory, experience working with set times, and a dozen other advanced concrete techniques. Be warned that while it is certainly possible to do concrete work on your own, it is important to manage your expectations since it would would be very easy to overestimate your skill finishing concrete. What Is The Best Concrete Mix? "The best concrete mix" will depend on what you intend to do with the concrete - there are many different mix variations for application specific uses. This page will teach you how to choose the correct concrete mix for your needs as well as how to mix, place and finish it correctly. Concrete is the most versatile building material on the planet so learning a little about how to work with it would be a great idea. "Concrete", "mortar", "cement", "grout" and "plaster" are all unique concrete mixes - but are essentially all the same. An aggregate, such as sand, pebbles or rocks mixed with portland cement powder and water. The water is the catalyst in a chemical reaction that causes the mix to harden during a month long curing process. No matter which type of concrete mix you are dealing with, the properties are all the same. Portland cement - The powder additive that you mix with aggregates such as sand which results in concrete after being actuated by water. Portland is essentially the glue that holds concrete together. Mortar - A form of concrete that uses only cement powder and sand as an aggregate. No gravel or larger aggregate would be used in mortar. Sometimes referred to as grout, especially when speaking in terms of swimming pool floors in vinyl liner pools. Grout - Grout is a mortar product (no large aggregate) that is most commonly modified with bonding agents for use as a filler in between joints in tile installations. Tile grout is available in sanded and unsanded versions where the sanded grout is better for larger grout joints and unsanded is preferable for smaller, detailed work. A "grout bottom" in a swimming pool would be a mortar product of sand and cement and not at all the same as tile grout in terms of the mix design. Plaster - Mortar based plaster is a product made from cement powder and very fine aggregates. The result is a very dense mortar concrete that is water resistant and suitable for fine detailed work, stamps and finishes. Strong, but not load bearing strong, plaster is typically used as a decorative surface treatment. Other terms for different kinds of pool plaster are marcite, marblite, quartzite and many proprietary names as well. Mortar plaster is different from gypsum or lime based plasters, though they function in a similar fashion. Exposed aggregate - Exposed aggregate, or pebble finishes are commonly found in swimming pool interiors as well as decorative finished flat concrete work. Essentially this is concrete that includes (and is seeded with) a specifically decorative aggregate stone that is small and has multiple colors. 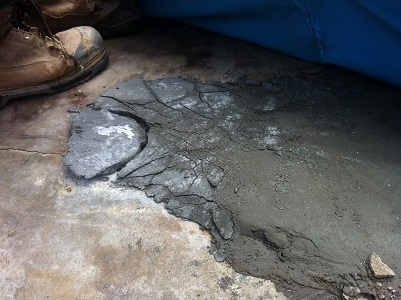 As it begins to set the top layer of portland cement is washed off revealing the "exposed aggregate" inside the concrete. Stamped concrete - Stamped concrete is flat finished concrete that has been troweled smooth and impressed with a texture imprint from a rubber mat. Integral mix colors or dry release powders can add color to the concrete, or color can be added after the concrete is cured already using paints or acid etching. Since there are so many different applications for concrete and mortar mixes, this section will discuss some of the commonly used mix designs and what they would typically be used for. If you intend to patch an existing concrete of any kind it is important to patch with a product similar to the base you are patching. Concrete of different mix designs can result in patchwork delaminating. Pool plaster - This is a very dense plaster mortar used for interior finishes of concrete swimming pools. You would typically mix 2 parts fine white silica sand with one part federal white cement powder (or 1 part fine sand and one part plaster / extra fine white sand). 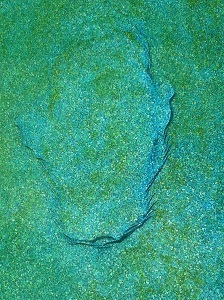 This mix is then typically modified with a latex acrylic. In areas where a faster set is needed it is not uncommon to add calcium to actuate the initial set more quickly however this can potentially compromise the quality and integrity of the mix. Asbestos was also used sometimes in pool plaster, which certainly increased the lifespan, though not something that you would typically do anymore. Beware of 20-50 year old pool plaster that is in uncommonly good shape for its age as it could potentially contain asbestos fibers. Vermiculite concrete - Vermiculite is a lightweight mineral that can be added to concrete (in place of some/all sand) which results in a concrete with unique properties. The vermiculite, being so lightweight as opposed to dense like sand, results in a mix substantially weaker than sand based mortar - however the concrete has a slightly "soft" or spongy finished strength that is great for protecting vinyl liners as well as being 10x as thermally resistant as regular concrete! Vermiculite concrete has a somewhat shimmery appearance as though there are gold flecks all through the concrete. General use concrete - The most common concrete mix for general construction use is a "3 - 2 - 1 mix". This mix would have 3 parts gravel (usually 1/2" or 3/4" clear gravel), plus 2 parts masonry sand, plus 1 part portland cement. This is the cheapest concrete mix by volume, while still being strong enough to meet the demands of modern construction. Mortar - Mortar, being concrete with no large stone aggregate, can have a ratio from 1-1 all the way up to 10 or 12 parts sand to 1 part of cement powder. The texture, finished strength , finishing ability, cure time and application for each mix is unique - for example you might build a natural stone wall with a mortar that is 8-1, or you may do a fine detail repair to some decorative concrete with a 1-1 mix. The strongest ratio of sand to cement is 3-1 and as such this should be the most common mix to use. If a finished detail is needed like with stamped concrete, a mix of 2-1 should produce very strong results that are slightly better suited to accept detailed impressions. Thin set - Thin set is the standard for tile adhesion. Essentially thin set is a mortar concrete that has been heavily modified with bonding agents, such that thin set is very well known for bonding to just about anything. If you have existing tile work that is falling off the pool you will be inclined to stick the tiles back on however the new thin set will have trouble bonding to the old thin set since very limited water can transfer between the old and new layer. If water can not permeate the substrate layer then you can not get a strong mechanical bond with the new layer. Bonding slurry - Bonding slurry is a thick, modified concrete paste that you use as a transitional layer in between old, existing concrete and a new concrete mix that you want to put over the old. This mix is water and portland cement mixed in equal parts (no sand) with a minimum of 10% bonding glue added. The result should be thick enough that you could paste it on with a brush (like half-melted butter). This is a deep technical subject and something that I cover in much greater detail in this article about how to bond new concrete to old concrete. Modified concrete, or fortified concrete, is any concrete mix that has additional ingredients added to it to change something about the properties. Concrete can be modified with bonding agents, accelerants, retarders, water reducers, air entrainers, colors and specialty aggregates. This would allow you to have limited control over the set time, strength, color, finishing properties, freeze resistance, viscosity and ability to bond to other concrete. This Liquid Acrylic admix is thin and white similar to how 1% skim milk might look. This product, when added to a concrete mix, will have a few different effects. It acts as a retarder, slightly slowing the time to initial set in the mix, as well as changing the texture slightly to a "creamier" finish. This product will also increase the water resistance in the final product. While this product also advertises as being a bonding agent at full strength (no dilution), it is preferable to make a slurry instead for bonding new concrete to old concrete. In an area with constant water immersion this latex product is preferable to the PVA based concrete glue products, however latex has less UV resistance. This is a universal bonding glue that is fantastic for concrete applications. Essentially a very thick, white glue this product can be added into almost any concrete mix to increase the bonding properties as well as the "stickiness" of the finishing properties. This is also the product that you want to mix with water and portland cement to make the bonding slurry for bonding new concrete to old concrete surfaces. This product also has a host of other potential applications, one of which is as a sealing agent over concrete, and another is for creating glass mosaics. PVA (polyvinyl acetate) is a thick white glue-like product and not to be confused (or used in conjunction) with acrylic latex concrete additives. Liquid Cement Colors like this are available in very limited color options. Dry color pigments can also be used with slightly more variance in color available. Basically, concrete can be tinted to earth tone colors like charcoal, red, brown, tan, and green-ish however since concrete is usually grey the finished effect is minimal and requires quite a bit of pigment added. Further, controlling color from one batch to the next is next to impossible so be warned that playing with colored concrete can be tricky. For more dramatic colors use a white cement and white sand mix - or apply color with a surface treatment such as paint or acid etching. Concrete water reducer, or Super Plasticizer is designed to be added to a concrete mix to increase the viscosity without adding water. Available in both powder and liquid form - a little water reducer goes a long way. The importance of this product is that the more water you add to concrete the weaker it gets. This allows you to achieve the working consistency you need for your application without compromising the finished strength of the mix with too much water. As mentioned above you must first determine what type of concrete that you have so that you can make a similar mix to patch with. Changing the mix design can have negative consequences in the form of cracking, shaling and delamination. In order for concrete to "bond" you will need to have a surface that water will permeate. 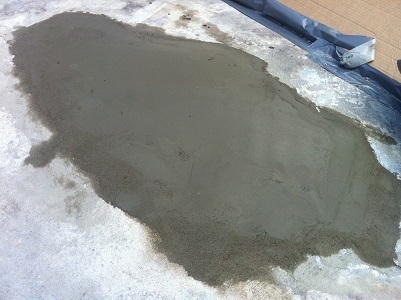 The existing concrete must be made damp, not wet, before applying new concrete. While not every person will go so far as to bond the new layer to the old layer this would be strongly encouraged. While some concrete admixture products claim to be a bonding agent when used at undiluted strength, I much prefer to make a bonding slurry and apply this to the damp, existing concrete a few minutes before I apply new concrete overtop. You do not want the slurry too wet such that it is pooling in the area you want to bond - you want to wait a few minutes until the bonding slurry starts to haze over, not dry completely, before adding your wet mix overtop. 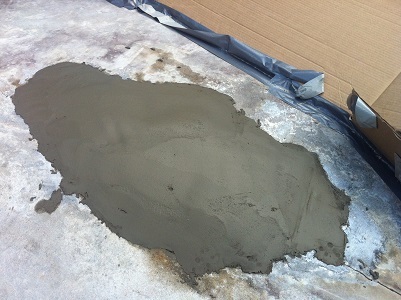 Under ideal conditions this bonding process will result in an 80% mechanical bond versus concrete that was poured in one continuous, uniform pour. If you have very dirty concrete that you need to bond to then the best process would be to pressure wash the area to remove all loose debris. Then wash the area with a strong TSP solution to help degrease any oils that might be on the concrete before we take the next step which is acid washing. Acid washing removes calcium, loose debris and portland, and helps to expose a virgin layer of substrate to bond new concrete to. After acid washing the pH of the concrete will be too low and you will need to again wash the concrete with TSP. A final thorough rinse and the concrete is now ready for a slurry and then the application of a new layer of concrete. If you want to bond new concrete to old concrete without a cold joint between the layers the only method to do this would be via shotcrete or gunite. The aggressive force at which shotcrete and gunite are applied are such that a sandblasting effect happens to the original concrete surface, and the new concrete surface will bond such that even in laboratory testing you can not differentiate the layers. 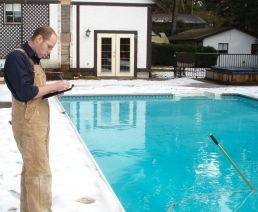 This is not practical for the average pool owner - but very interesting information none the less! If you are interested to know more about concrete bonding adhesives and how to patch concrete in such a way that it will last then you should read this more detailed article that I wrote that attempts to answer question that sounds simple enough on the surface: How do you bond new concrete to old concrete? "Can you patch concrete underwater?" - Yes, actually you can. Hydraulic cement, fast set mortar (not regular fast set mortar), aqua plug, fabric plug, water stop concrete and other variations are all potentially describing an extremely modified mortar product that is so accelerated that it will go from wet to rock hard in 30 seconds or less. So much so that you could take a handful and swim down to the bottom of a swimming pool and jam it into an actively leaking crack! Under ideal conditions it works even better if you can drain the pool and cut / patch with hydraulic water stop cement. In addition to be modified for bonding, similar to a thin set mortar, it also expands slightly as it cures which is unique - regular concrete does not do this, in fact it contracts ever so slightly. How do I know which concrete I need? Fast Plug is one brand of patch mortar suitable for swimming to the bottom of a swimming pool to patch with. Also suitable for plugging actively running leaks - when mixed wet this will take between 3 to 5 minutes to set, where mixing dry and in hot weather this mix can go from wet to set in 30 seconds or less. The fast cure properties of this concrete are a result of an extreme chemical reaction - as such there is a great amount of heat generated by the concrete and the potential for chemical and heat burns is far greater than with traditional concrete applications. Another brand of the same style of product is Quikrete Water-Stop Cement as well as Dap Quick Plug Hydraulic Cement . IMPORTANT NOTE - There is a similar product called "cement patch" which is often sold alongside the hydraulic cement product. This "concrete patch" product usually will have a 30 minute set time instead of the 3-5 minutes. These concrete patch products are NOT SUITABLE for use in patching the floor of vinyl pools and can potentially be a problem with concrete pools as well. This product has a reaction that will result in the growth of crystal / calcium from the patch. In serious cases I have seen many vinyl pools with HUGE growing patches that can grow up to ten times their size - which results in gigantic growths under the liner. "Can I add water a second time?" - Absolutely not. Once the initial set has begun and the concrete is turning hard you can no longer add water to it to achieve desirable placement viscosity. If need be, waste the concrete and mix a fresh batch. Adding water after the initial set will compromise the concrete entirely. "How much water should I add?" - The answer to this is simply to add the absolute minimum amount of water possible to achieve the placement viscosity you are looking for. The amount of water that you need to effectively and efficiently make concrete actuate is far less than you need to be able to work with it easily. Basically concrete with the wetness of slightly damp sand would produce the strongest finished result. This is why water reducers are so useful since most concrete applications require a more viscous mix than damp sand in order to place and finish. Water reducer allows you to have any placement viscosity you need while maintaining optimal water levels for the strongest cure strength. "How long does concrete take to cure to full strength?" - Concrete takes approximately 28 days to reach full cured strength. At about one week the concrete is approximately 75% cure strength and after 48 hours the concrete would be approximately 50% cure strength. The 28 day concrete cure time, it should be noted, is actually not entirely true but instead an adopted industry standard for when to test concrete for compressive strength. "Cured" concrete is actually somewhat misleading since what is really important is the strength of the concrete. If a concrete can reach a suitably high compressive strength for its application in less time than 28 days then effectively it is "cured" to the extent that it is required. Unless you are building a bridge this is entirely too much information and you can just work with 75% strength at one week and 100% strength at 28 days as working values. "Can I use play sand instead of masonry sand?" - That would depend on your application. If strength is important to you, as like with a mud base for a tile finish, then forget about it. Play sand has been tumbled to remove all of the potentially sharp edges. Without all the random sharp edges to the sand, the strength of the mortar is compromised greatly. Brick sand and graded masonry sand would be better options. "Can I make concrete with X" - There are so many things you can add to concrete in place of regular stone and sand aggregates to make unique and application specific concrete products. Peat moss, wood chips, glass breads, perlite, vermiculite, sawdust, computer chips, crushed marble, powdered crystal and many more. In almost every case substituting these aggregates, even in smaller amounts, will drastically reduce the finished strength of the concrete. Step 1: Do not over trowel the concrete - As you trowel the concrete you raise water to the surface. If you trowel too much this will result in the top layer of the finished concrete being too weak from the concentration of water. A skilled concrete worker would place the concrete as flat as they could get it within just a few light passes and then leave the concrete to "stiffen up". As the concrete begins the set process it will lose the glossy, watery look to the surface and take on a dull sheen. This window between too watery and once the concrete is actually too hard to finish further is when the most accurate finish can be applied with a trowel. Knowing when to walk away and let the concrete set for a bit can mean the difference between a quality finish and an amateur finish to your patch. Step 2: Use a sponge float to marry the edges of your patch - Using a damp sponge float and working in a circular pattern you can very effectively fix the elevation differences between your troweled patch and the original concrete surrounding the patch. After a very light sponge float you can carefully trowel the concrete again to get a smooth finish. Alternatively, like with patching a vinyl pool floor, you can leave the sandy texture that comes from using the sponge float and use a scraper to take down and high spots or exposed stones after the patch has set. Working with concrete takes practice, and a skilled hand can make finishing concrete look incredibly easy - which it is not. After reading this page you now know as much or more about concrete than basically anyone who does not work with it professionally. Patching some concrete on your pool deck or filling a crack, or replacing a few tiles is something that you can do - just be realistic about how the finished results will look. If you are certain that you want professional looking results then perhaps concrete work is best left to the professionals.